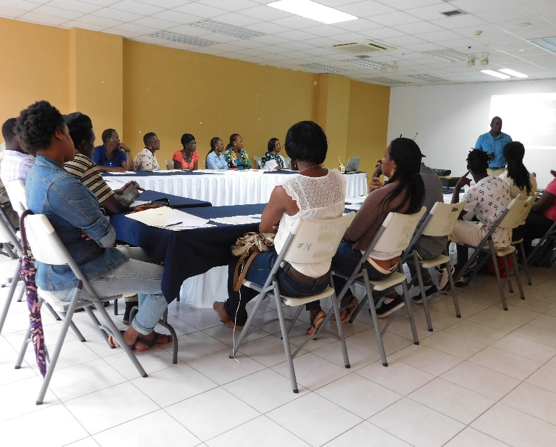 On Wednesday, 29 June, 2016, the Ridge to Reef Project facilitated the first of three ‘Business Planning and Development’ workshops at the Grenada National Stadium. The initiative was implemented through the Department of Forestry, Ministry of Agriculture, Lands, Forestry, Fisheries & the Environment. Business Consultant, Mr Ruel Edwards, hired through the Ridge to Reef Project, facilitated the workshop with a group of 21 participants. The workshop was the first of a series of training that will take place over a 3–month period; the training runs from June to 30 August 2016. Mr Edwards introduced the participants to some of the important factors that they need to consider when developing a business plan, as well as some critical procedures to follow when implementing their business idea. He provided the participants with guidelines on what should be done, from registering their business, to marketing and selling their products. Additionally, the participants were provided with a worksheet to help create their business concept. During the training, Mr Edwards also highlighted that a key component of the training is to encourage participants to create more eco-friendly businesses. “The workshop is part of the overall objective of creating new and reviving existing sustainable livelihood opportunities for persons in the project demonstration area, while building on the achievements and progress of the past OECS/OPAAL project”, said Mr Anthony Jeremiah, Chief Forestry Officer (Ag.). The Ridge to Reef Project and the Forestry Department are taking an approach to engage persons directly affected by all their project initiatives. In the coming weeks, the participants will receive one–on–one mentoring with Mr Edwards, as they continue to learn and benefit from this Ridge to Reef approach to Sustainable Development: Business Planning and Development Training.